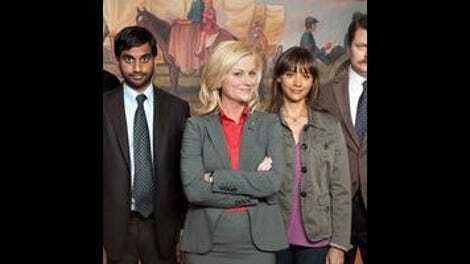 At its best, Parks And Recreation has shown a fierce willingness to push its characters forward. The show’s second and third seasons don’t necessarily feature vast, overarching narratives; season three had the Harvest Festival, but even that was resolved in a fairly quick seven episodes, compared to the following year’s season-spanning election storyline. Still, what the second and third seasons succeed at so brilliantly is their serialized characterization, creating the sense that this world is inhabited by dynamic characters who are never quite the same people at the end of an episode as they were at its beginning. And perhaps because most of those character arcs were clear upward trajectories—Leslie outgrew her early incompetence, April opened up as a person, Andy matured just enough that he became a vaguely functional human being, Tom decided his entrepreneurial dreams were worth actually chasing instead of just talking about—the show began to run into trouble once its supporting characters had succeeded as much as they realistically could without totally blowing up the show’s core premise, leading some to regress (most notably Tom) and others to pause in their development, repeatedly cycling through a handful of character beats. As for Leslie, the show often seemed uncertain how best to move her forward, throwing up a succession of plot-heavy, often cartoonish obstacles without being totally sure how much her own flaws might be part of her latest troubles. That’s an oversimplification, admittedly, and it reads more negatively than I really intend it. But these sorts of issues help explain why latter-day Parks And Recreation has had trouble building successful overarching narratives even as it remains satisfying on an episode-by-episode basis; the characters remain a great deal of fun to spend time with every Thursday, even if it’s not always been clear where they are headed in a larger sense. It’s also a huge reason why the opening sequence of “London” is so refreshing. Picking up right where last year’s finale left off, the episode reveals Ron’s reaction to the life-changing news that his beloved Diane is pregnant. When she asks what he thinks about all this, Ron never hesitates. Producing an engagement ring he had planned to give her during a canoe-centric anniversary celebration, he immediately proposes, and an overjoyed, honest-to-goodness beaming Ron is wed less than half an hour later. This might seem like a huge reversal for Ron Swanson, who in “Are You Better Off?” had proudly declared his sincere wish that everything remain just as it is forever. But that was never really true, as even before Diane’s unexpected pregnancy—as much as the hyper-virile Ron’s ability to conceive a child can really be considered unexpected—he was already planning to marry her. The opening sequence represents Parks And Recreation once again making the strongest possible choice, dispensing with any unnecessary buildup and just pushing Ron into uncharted territory. A new father freaking out over a surprise pregnancy is well-worn material, and such a plotline would simply delay the inevitable moment when Ron accepts his paternal responsibilities. Frankly, both Ron and the show itself have better things to do, starting with the premiere’s big trip to London. The show’s British sojourn was conceived as a way to accommodate Chris Pratt’s filming schedule for Guardians Of The Galaxy; his superhero star turn also explains why Andy has suddenly lost 50 pounds of beer weight, a justification that wisely doesn’t even try to be convincing. Andy and Ben’s London scenes are mostly just an opportunity for Pratt to goof around with the great Peter Serafinowicz, who plays Lord Covington with the upper-class British version of Andy’s own sweetly innocent idiocy. The pair immediately hit it off, bonding over their shared love of remote-control helicopters even as Edgar bashfully suggests his family owns Scotland. These scenes work well as throwaway silliness—lest I sound overly serious, I should stress that Parks And Recreation is allowed to just be funny and nothing more, at least occasionally—but Ben’s interaction with Andy and Lord Covington ties back to the central point of “London.” One of the episode’s funniest little moments comes when the two grown men, both of whom tower over Adam Scott, ask whether they can go get ice cream. Serafinowicz’s body language is particularly reminiscent of a little boy, uncertain whether the joyless adult will let him have some fun for once. It’s a reminder that just about everyone in the Parks And Recreation universe is essentially an overgrown child, although it’s the ones in Pawnee who are most given to temper tantrums. That’s what Leslie struggles with throughout “London,” as she tries to reconcile her undying love of all things Pawnee with her growing frustration with its citizenry. Her big speech before the International Coalition of Women in Government is undoubtedly cathartic, and the emotions behind it are entirely understandable. Ron’s two reactions to the speech are telling; he initially tells Leslie that he loved it, because it’s hard to imagine how Ron Swanson would not love something like that, but he’s still sensible enough to later remind Leslie that she’s the adult in this situation. She can neither demand nor even expect gratitude from the people she represents, and Leslie has her own childish moment in response to Ron’s ageless wisdom. As Ron and Leslie share that moment on a bench overlooking Westminster, the birthplace of parliamentary democracy, the show essentially argues that Leslie’s political career means that she must ignore her natural human reaction to the awfulness of those around her. Looking ahead to the rest of the recall fight, that suggests a tricky narrative path, as Parks And Recreation is placing Leslie in a position that isn’t necessarily relatable or intuitive to the audience. But then, tonight’s episode isn’t really concerned with how Leslie relates to her constituents; rather, “London” reminds viewers of the personal connections that make Leslie who she is. Ann is finally pregnant, and she and Chris fast discover that nobody in Pawnee is capable of responding to their wonderful news in the way that they desire—nobody, that is, except Leslie Knope, which is why the exasperated couple finally give up on their other coworkers and start calculating how long until Leslie’s plane lands. Ann’s line to Leslie about how her reaction makes up for everyone else’s indifference is shamelessly on-the-nose in how it ties together Ann and Chris’ subplot with Leslie’s own search for gratitude, but it does make absolutely clear why it’s so important that April read out her—sorry, Satan’s—heartfelt letter to the International Coalition of Women in Government, in which she explains why Leslie is so special to those who know her. The challenge for Leslie and for the show as they gear up for the recall is going to be convincing everyone who doesn’t know Leslie of her specialness. As April observes in her letter, those lucky enough to call Leslie Knope their friend soon discover that their lives get better every day. The people of Pawnee might not know it yet, but Leslie Knope considers all of them her friends. They just happen to be acting like childish jerks at the moment, but neither Leslie nor Parks And Recreation gives up without a fight. Tom’s subplot, in which it’s revealed that Jean-Ralphio and Mona Lisa’s vindictive dad is his mysterious competitor, is generally excellent. Indeed, it essentially frames Tom’s struggle this season as a miniature version of Leslie’s own fight, as Tom’s dream is under threat from the selfish idiots he associates with and the disingenuous antagonist who claims to be looking out for best interests of the little people (who are, in this case, his own children). Henry Winkler is already great as Dr. Saperstein, adding a wonderfully villainous dimension to his usual mild-mannered, buffoonish persona. I’m also very glad to see Marc Evan Jackson return as Trevor Nelsson, who is the kind of straitlaced lawyer still hip enough to instantly recognize a Transporter reference. “The reception will be held in each of our individual houses, alone.” Somehow I doubt marriage is going to change Ron Swanson all that much. Also, I’m glad the show finally addressed whether “Tammy” was lurking somewhere in Diane’s name, then immediately dismissed it. “There’s a pub between those two butcher shops.” “Let’s go to that one, but we’ll be stopping at those two butcher shops.” Ron may be the apotheosis of America—he totally is—but the United Kingdom is clearly growing on him. That final trip to “these tiny islands off the coast of Scotland,” complete with recitation of the Robert Burn’s poem “O Were My Love Yon Lilack Fair”, was a wonderful side trip for the episode, offering another timely reminder of just what Ron and Leslie are all about, not to mention some seriously gorgeous scenery.